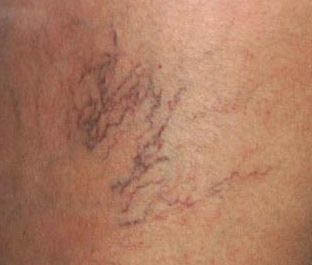 Telangiectasias, or spider veins are small red, blue or purple web-like veins on the surface of the skin. The causes of spider veins are undetermined. However, heredity, age, gender and number of pregnancies may contribute to the development of spider veins. Who should treat my varicose veins or spider veins? Spider veins are treated by a variety of professionals with different specialties. It is important to choose someone who is experienced with the complexities of diagnosis and a variety of treatment options. An Interventional Radiologist is a specially trained medical doctor who can perform minimally invasive therapies in all blood vessels throughout the body. Interventional radiologists are board-certified and fellowship trained. All of our interventional radiologists at the Memphis Vascular Center are board-certified and fellowship trained. Our office is located near Memphis, TN in Germantown. Our 8 interventional radiologists who work at our Memphis TN office are all board-certified and fellowship trained. Sclerotherapy is the best way to treat spider veins on the legs. A special medicine is injected into the vein by using a very fine needle with the help of a vein light. The medicine causes the vein to seal itself. The spider vein(s) will typically disappear within 4-12 weeks. It may be necessary to have multiple sessions depending on the number of spider veins. Are there any complications from sclerotherapy? Sclerotherapy has rarely been associated with serious complications. There are a few mild side effects such as bruising, itching, tenderness or tightness that could continue for up to two weeks after the procedure. Mild pain may be treated with ibuprofen. Staining can occur in some patients. Most staining will resolve in 10-12 months. However, some staining may not resolve and a referral to a dermatologist is needed. In extremely rare cases, ulcers can occur from sclerotherapy. You will be able to return to your normal activities immediately after the procedure. Wearing compression stockings for 2-3 days after the procedure can improve the cosmetic appearance. After Sclerotherapy, there is a small chance new spider veins may appear. We recommend treating those areas as they appear. The spider vein(s) will typically disappear after treatment within 4-12 weeks.